One of my top 20 regrets in life (possibly even top 10, but more likely around #15 or so if I went through the process of considering and ranking regrets, which is too unappetizing to ever happen) is that in my mid 20s, in a fit of angst over some boyfriend breakup drama, I threw out part of my collection of concert ticket stubs. 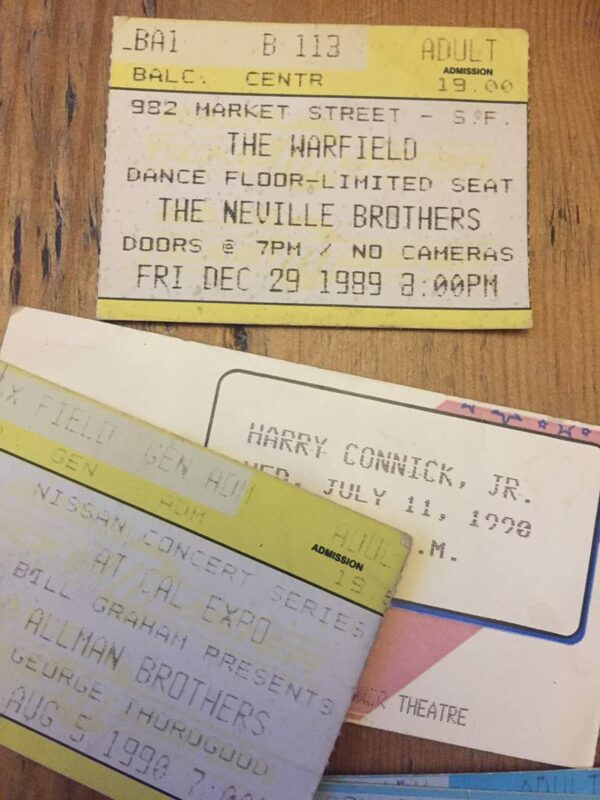 Threw them out – my own history, proof that I was there, mementoes of live performances dating back to my very first time: Blue Oyster Cult and the Johnny Van Zant band when I was around 14 in 1981 or 1982. 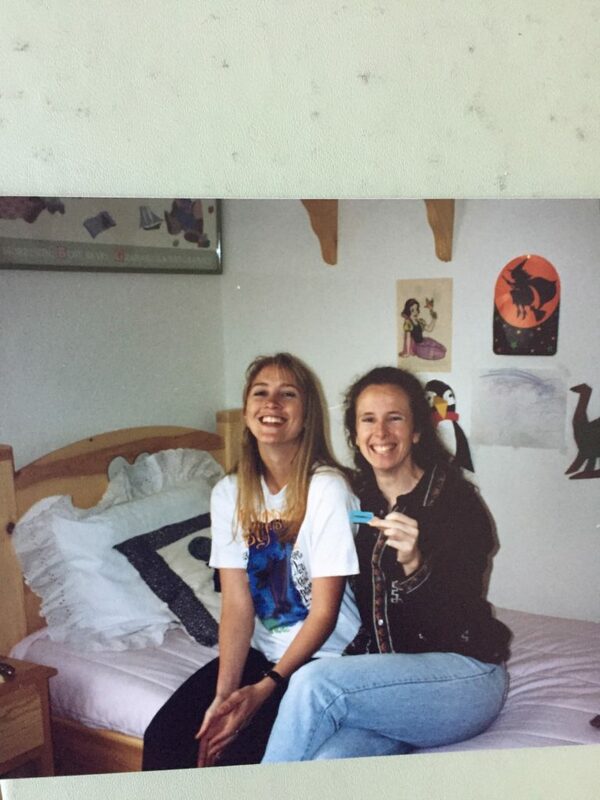 My best friend Patti wore her sister Susan’s Rush T-shirt, my hair was permed, and oh we thought we had arrived that night at the Selland Arena in Fresno, doing endless people-watching laps, studying behavior to get the hang of things. 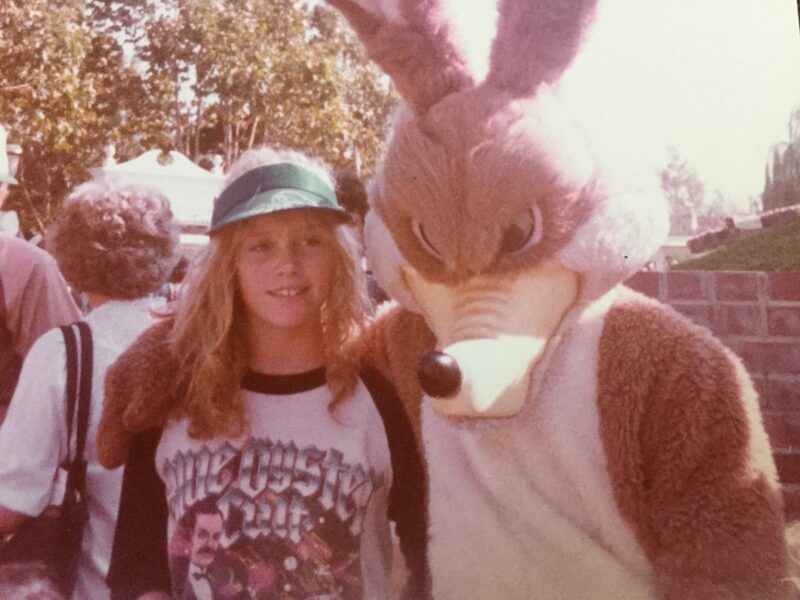 I bought my first concert T-shirt that night, which I then wore to Great America (a west coast theme park) to canoodle with an evil wolf-rabbit, apparently. What the hell was I thinking throwing those away? Details are scant; I was made senseless with grief, apparently. But all is not lost. For some reason I didn’t throw them all out. My square box still holds 136 ticket stubs. 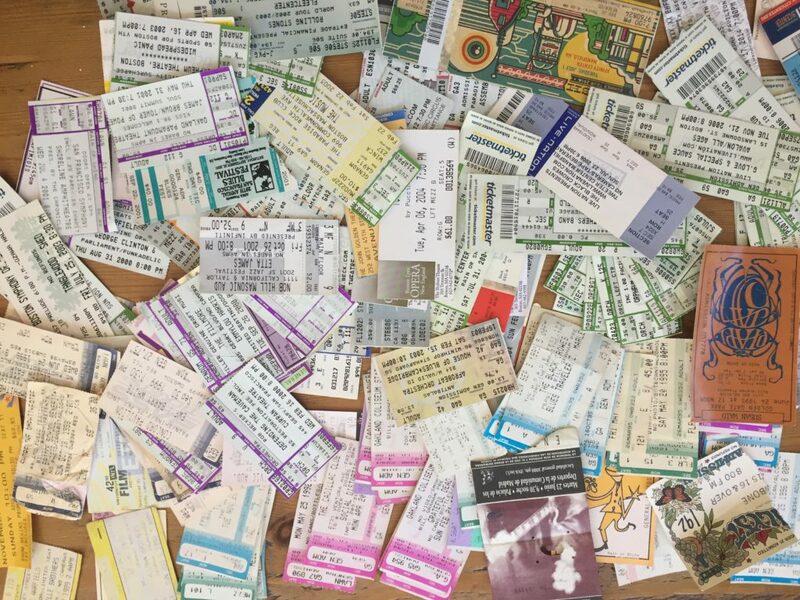 There are more Allman Brothers stubs than any others. Which is funny – thought I had seen REM the most. Maybe I threw out the REM ticket stubs. 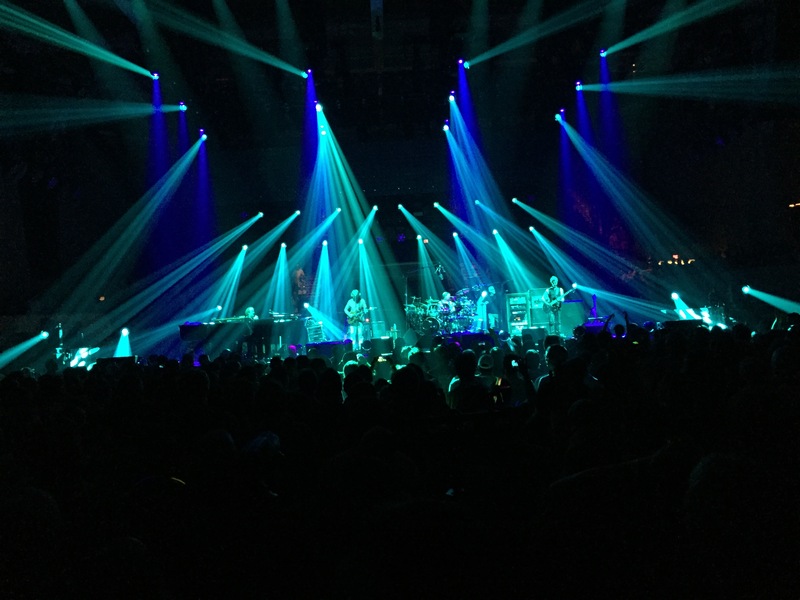 This week, I organized my collection by year, and went to some shows at Memory Arena (where sometimes I had a seat front and center, and other times couldn’t get in at all). 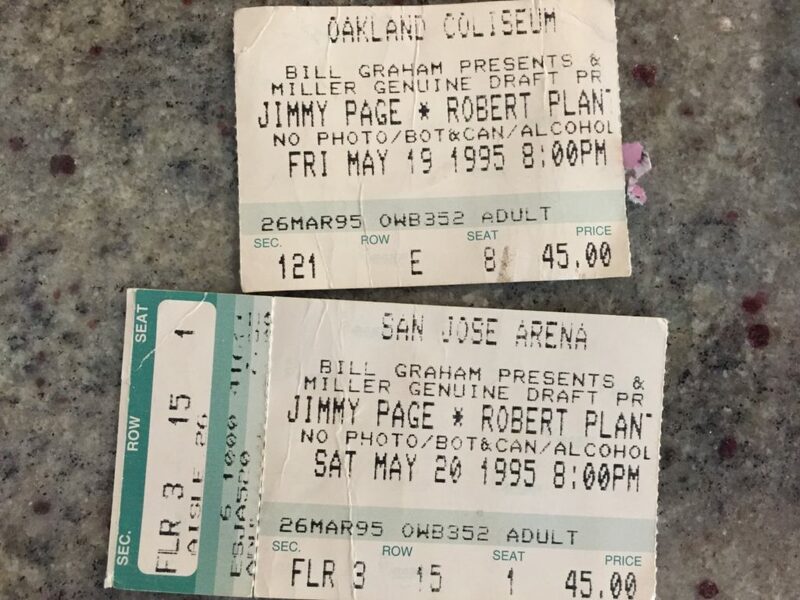 After the first Page and Plant show, my friends decided we’d drive to San Jose and scalp tickets to see the following night’s show. It was expensive by our standards, but we all had jobs and credit cards, so we could actually do it. It was my only experience “following a band” and it only lasted one weekend, but it made my heart burst. 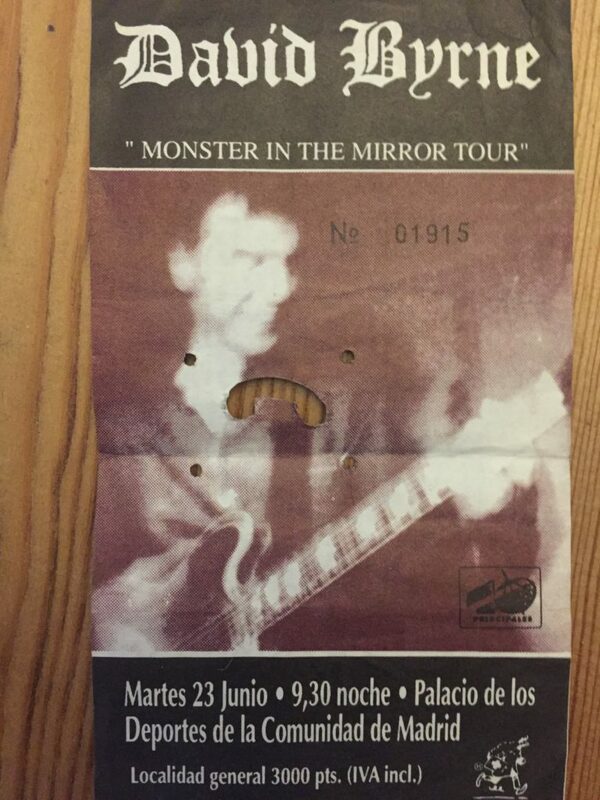 That contrasted comically with a David Byrne show in Singapore many years later, that occurred in a high school gym-like space, audience on bleacher-type seating, silent, motionless, no one moving a muscle or standing up, self-conscious applause at the end of each song only after we instigated it. Many friends and peers no longer go to shows, having lost their stamina and tolerance for staying up late, lengthy drives in and out of suburbs, highway robbery in the form of parking fees and ticket prices, onerous babysitting situation/conflicting kids’ sports schedules, unruly crowds, security fears, and on and on. Can’t blame them. The reasons to stay home are legion. And yet…we can’t call it a night. During the “season,” when outdoor venues and festivals sweep merrily through town, we hit “buy now” on the first wave of shows, tell ourselves “That’s it for the summer, no more tickets!” then ignore ourselves when the next show is announced. We also buy tickets the rest of the year. We’re at our most profligate by far when deciding to attend live music. Aftermarket? Fine! Dinner beforehand? But of course! Plane tickets for the Dead’s 50th? Fire up Expedia! When people join together to appreciate live music, camaraderie blossoms – strangers instantly speak the same language, communicating with a nod, a smile, a raised eyebrow as comment on a song, solo or lyric. People talk to each other at concerts too. And share space, water, snacks, whatever. Concert atmosphere radiates jubliation and excitement. The energy flowing from hundreds, thousands, sometimes tens of thousands of people singing part of a beloved anthem in unison is difficult to describe. But the feeling of connection to humankind it produces is the most spiritual experience I’ve ever had. Shows are church-like in some ways; we are silent in unison, we sing and chant and applaud our praise in unison, we worship and are transported and we don’t need to understand why. It’s religion for all who come. Every stranger is someone who chose to come to this show to hear this music with me. We chose each other for the evening; we are part of each other’s lives tonight. Children, grandparents, college kids, young professionals, mid-lifers: we’re all here, arriving from a rainbow of backgrounds and circumstances to share this. We’re so much more alike than different at concerts. Concerts foster togetherness in a stronger way than many other live performances because the feel-it-in-your-bones volume and larger-than-life spectacle lets you communicate freely with others without disrupting the proceedings. You can’t get to know the person next to you at a play or a playoff game. Certainly there are times when audience members let you down one way or another, but it’s a rarity. I’ve let people down. Although in my defense I will say why, people behind us, did you not stand up for ANY part of Paul Simon in Los Angeles in the late 90s? We’re sorry for blocking your view but you should have stood up as well, the man is a god! Some of the highest and lowest points of the last 35 years of my life show up in my ticket stub box, along with many points in between. 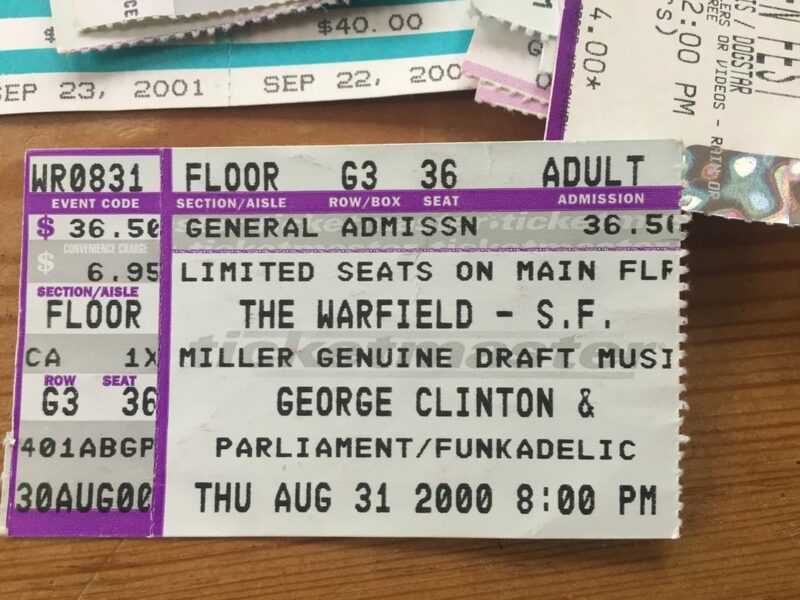 Maybe I’ll put all the stubs in a book for ease of viewing; I could turn into the old lady cuddling grandkids on her lap, turning pages of the album, pointing out each ticket stub, rambling loudly and repeating myself with tales of shows back in the day. Things will be so different by then; things are already so different. Smuggling a joint is quaint; The Man now wants to know if you’re smuggling explosives and weapons. The Orlando nightclub massacre and the Ariana Grande concert bombing brought the worst of humanity to the most free and joyous places. The pain inflicted will last lifetimes, and we can assume others will try to expand that legacy of suffering. The new normal – unease anywhere throngs of people gather – has tainted concerts, and much of what we were fortunate enough to take for granted in our country. But it hasn’t, and won’t, vanquish them. Artists need to make art. The rest of us need their art for our souls. So when we can, we will invest and journey to places where it’s created for us. We will be surprised by every note that varies from recorded versions of songs we love, and we’ll delight in glimpses of musicians’ inner lives as they speak to us, joking, lecturing, seeking to connect to us in return for our devotion. We’ll smile and talk to strangers, dance with them, hold their purses while they go to the bathroom, take turns buying drinks for each other, help them find a lost car in the parking lot, laugh, clap and marvel with them at the gift of the evening that we’re receiving. Loved this piece! Triggered so much nostalgia for me. Regretting not saving all of of my ticket stubs. The stories they’d tell! Great piece made me think back to that first U2 concert in 1986…! That is such a cooler first show than Blue Oyster Cult! What is your favorite size of venue these days? Why? Has it changed since youth? Can’t pick a favorite size…really still like big just as much as small. I think in our youth I preferred the atmosphere at big shows, though at small shows we had better chance of meeting and talking to the bands or artists. Main change is that nowadays I’m not as psyched about huge venues unless we’re close enough to watch the stage as opposed to just watching the monitors (see middle-aged concert-going extravagance section 4.6). such a beautiful, beautiful piece! Amazing – I can relate whole-heartedly to the entire sentiment of your piece. Concert going has been a way of life. A life long love affair for me, and some of the happiest moments in all my time here on this Earth. And I’m still going strong thank god! Seeing Tom Petty this weekend among many other acts at the Arroyo Seco Festival! As you know Coachella has been a big part of our joy over the last decade (although probably over for us now with the inclusion of acts like Beyonce, Kanye, Lady Gaga and the like – not into it AT ALL) Those years camping and seeing one incredible act after another all day and night long was WONDERFUL!! It will always be a highlight of happiness in my heart. A funny side note about all those ticket stubs – Matt and I share dozens and dozens of the same ticket stubs, but one night off. His all are from SF area shows and mine are Fresno. It’s amazing how many shows we saw in a period of 15-20 years a day or two apart! And there are a few that we were both at when we were very young – Day on the Greens, Mountain Airs etc. So great. Makes us so happy how much we love rock, and theatre:) It was our early draw to one another and continues to be such a bonding point for us. So nice.